We are Gorton’s Seafood Ambassadors. 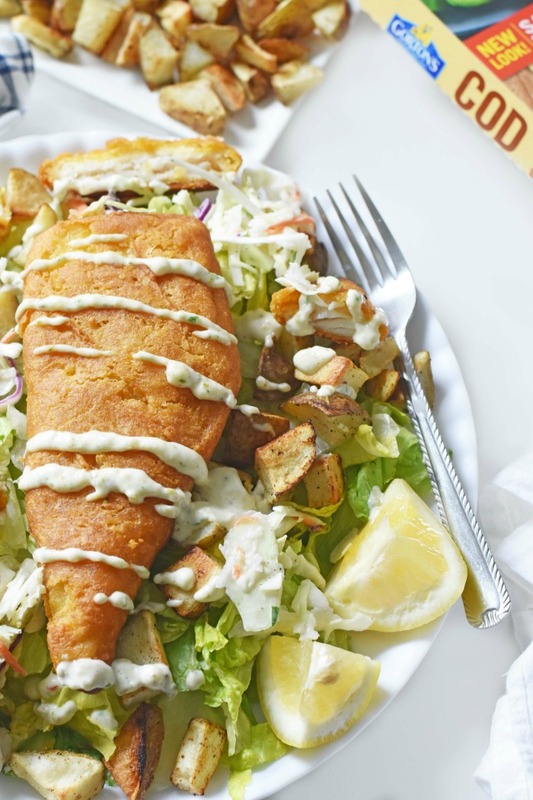 All tasty views expressed in this Fish & Chips salad post are that of our own. 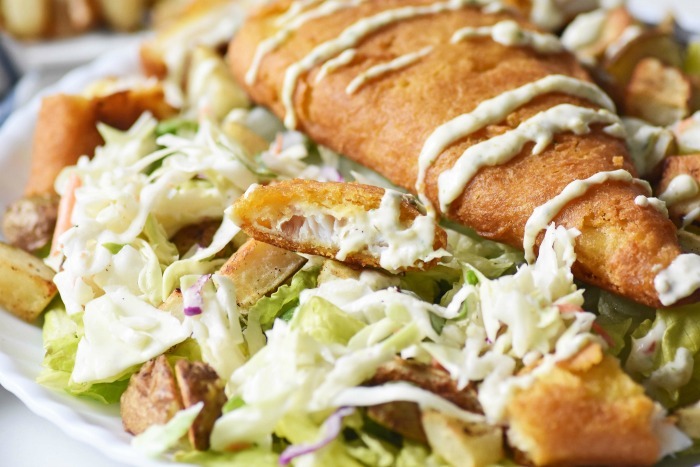 Fish & Chips is one of my favorite meals to order when Jared and I go out to eat. But, it has to be codfish. 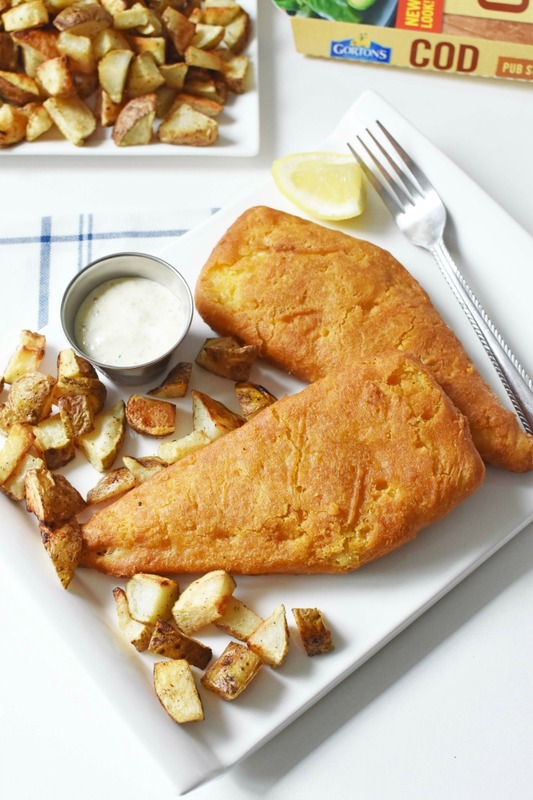 I don’t really care for other types of fish like flounder used for fish & chips. I prefer the white, light, and flaky texture, and mild taste of cod. 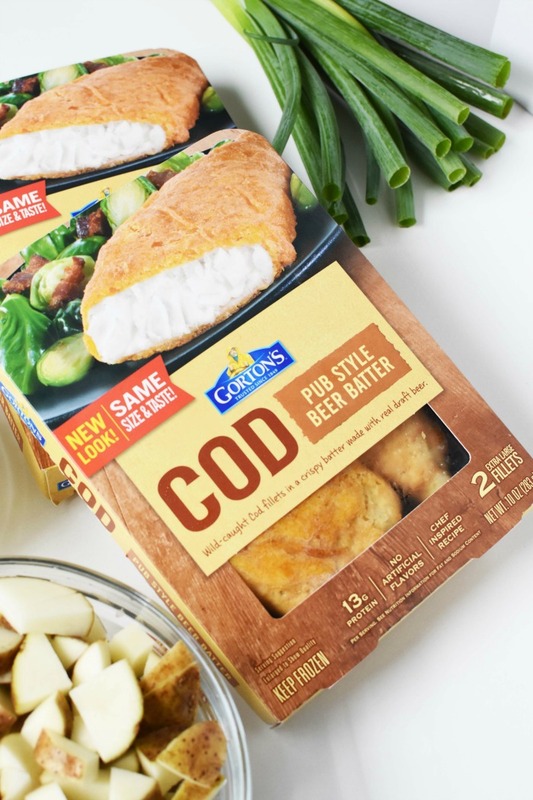 That is why I am LOVING the ALL new Gorton’s Pub Style Beer Batter Cod Fillets, 2 count. These extra large pieces of premium white meat cod are large enough to make a meal for 2. 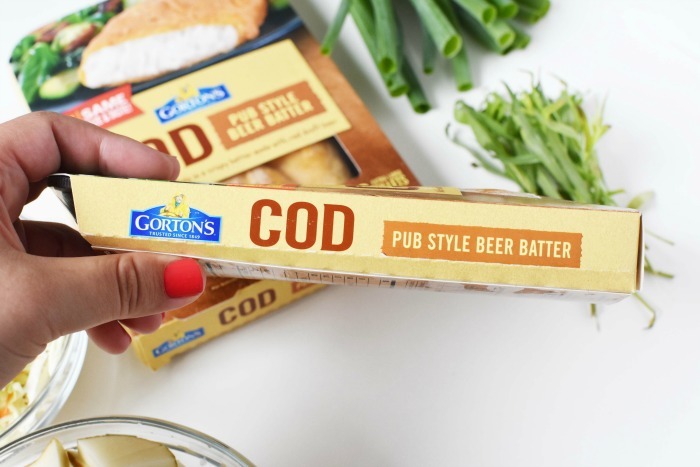 Since I do consider myself a fish & chips snob, I have to admit–Gorton’s really knocked it out of the park with this product. When baked according to the package (easy peasy), these filets crisp up to pure deliciousness. Each filet is battered in real draft beer, and you can totally taste the difference with each golden, flaky bite. 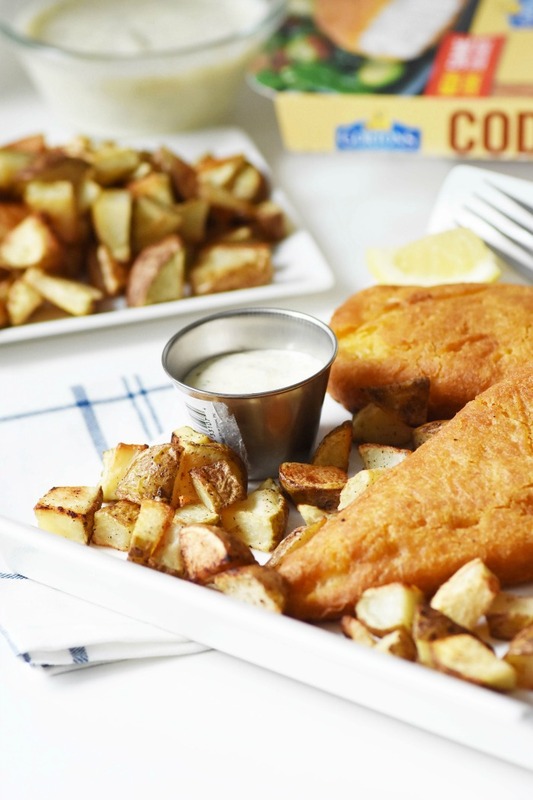 In fact, I really need to take date nights in because these Pub Style Beer Batter Cod Fillets are my new all time favorite! Of course, you can simply prepare them and enjoy them with some fries or a salad, but I wanted to make a more upscale, and fun kind of meal. A meal that my husband and I would enjoy with every bite! 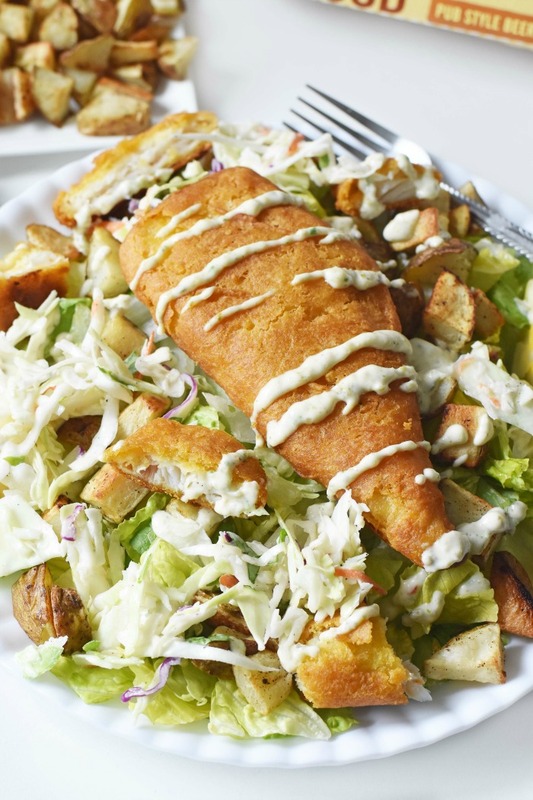 I truly think this Mouthwatering Fish & Chips Salad with Potato Croutons is a must-try! Plus, despite the fact that it might look gourmet, this meal is not hard to prepare. In fact, you could totally pull off a romantic dinner for 2 with this recipe! But, you might want to buy 2 packages of fish because it is *that* good! Salads are some of my favorite ways to eat foods. You can do so much with them due to their endless versatility. 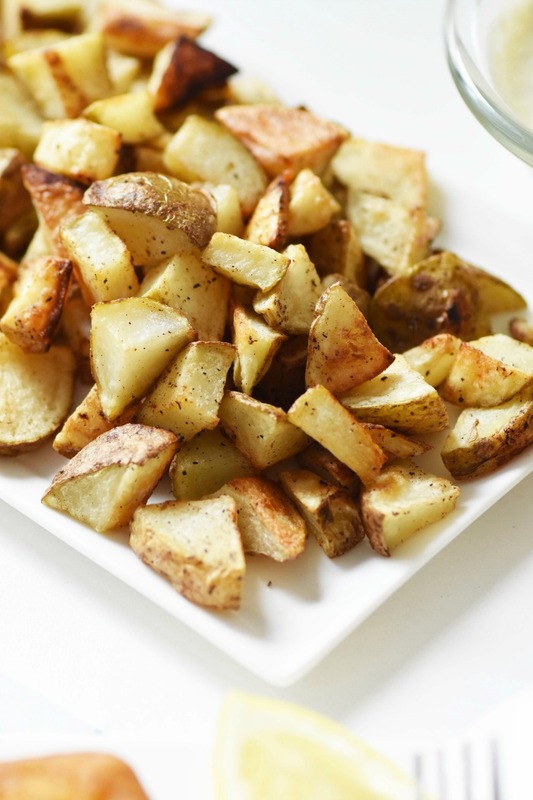 Rather than make bread-based croutons, I wanted to take my own play on fries, and make potato croutons. 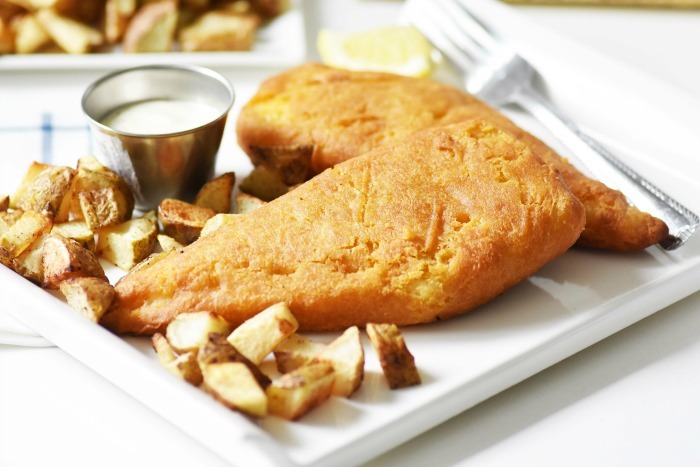 Similar to home fries these oven-baked golden bites of goodness pair so well with the fish and homemade tartar sauce & cole slaw. 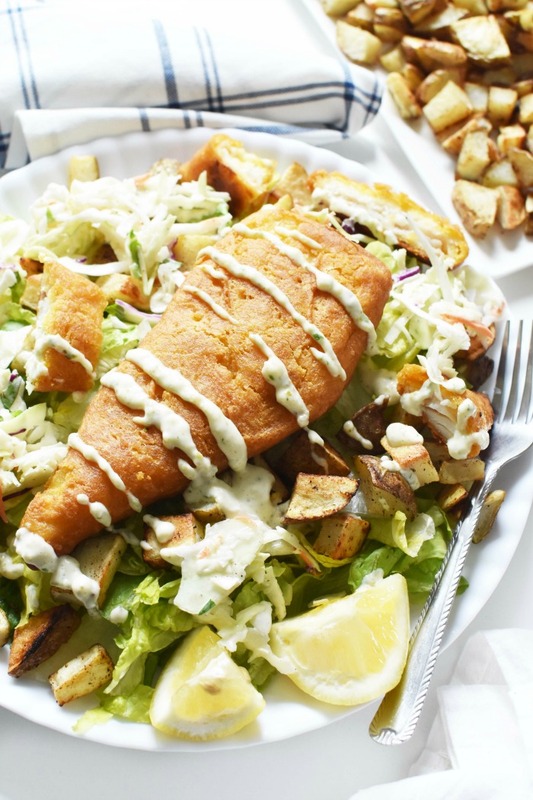 The sweet slaw flavors pair perfectly with the tangy tartar sauce dressing and provide the perfect amount of flavor for the seasoned potato croutons. The best part is this meal took 30 minutes to make. I used my air fryer for the fish (you can use an oven too) and I used the oven for the potatoes. I used tarragon to really make the flavors of the slaw & dressing POP. Tarragon has such a fresh flavor and pairs so well with seafood. To get the dressing thinner, I used lemon juice, mayo, tarragon, sweet relish, onion, and garlic powder, black pepper, and green onion, but I blended it until creamy. This dressing really buttons up the flavors of this dish and will make your mouth water. 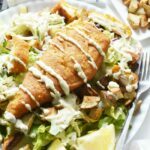 If you love quality fish, and a good salad I totally suggest you recreate this Mouthwatering Fish & Chips Salad with Potato Croutons. You will not be sorry! 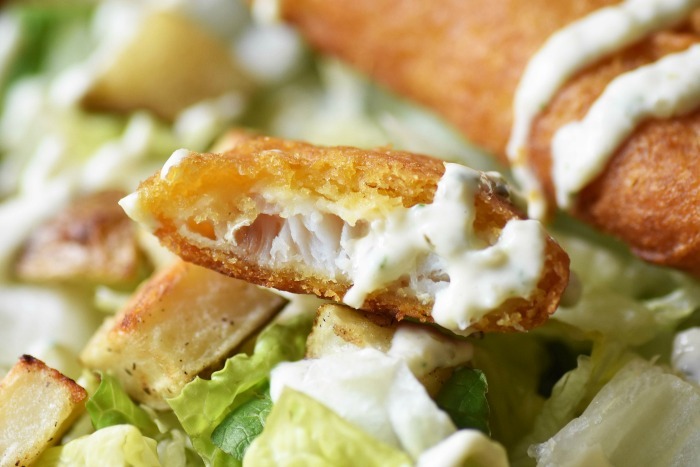 An upscale fish & chips salad that features a homemade tartar sauce dressing and potato croutons. 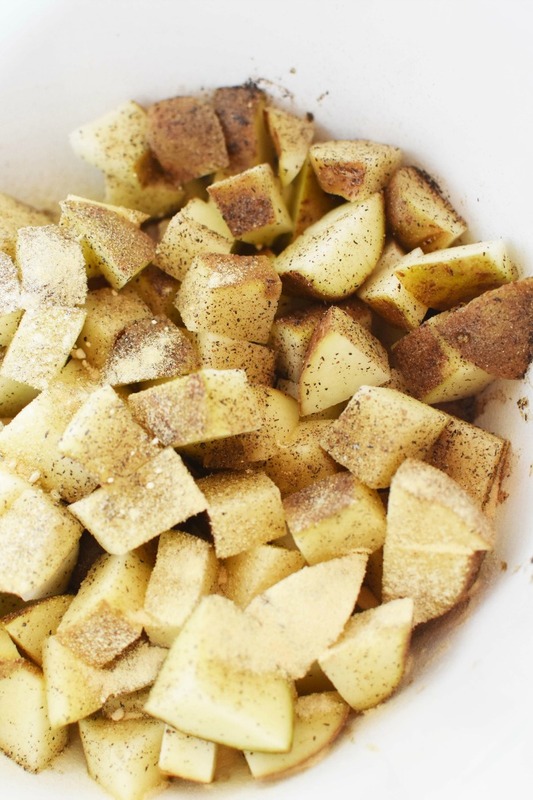 Dice up potatoes, and toss them with oil, and spices. Cook for 30 minutes at 425 turning them every 10 minutes with a spatula. Bake Gorton's fish according to the package instructions. 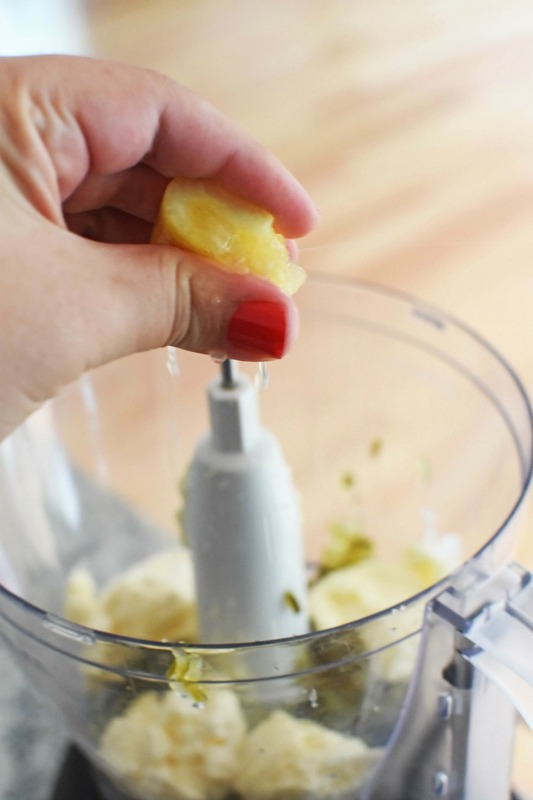 For tartar sauce dressing, blend mayo, relish, green onion, lemon juice, and spices until creamy. 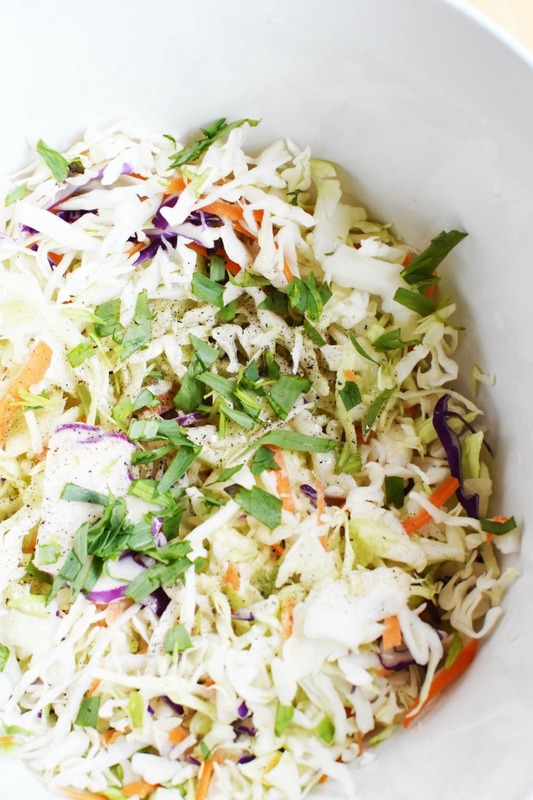 For coleslaw, mix the dressing, and chopped tarragon with the cabbage blend. Prepare two plates with lettuce blend, and coleslaw. Add one piece of fish to each and potatoes. 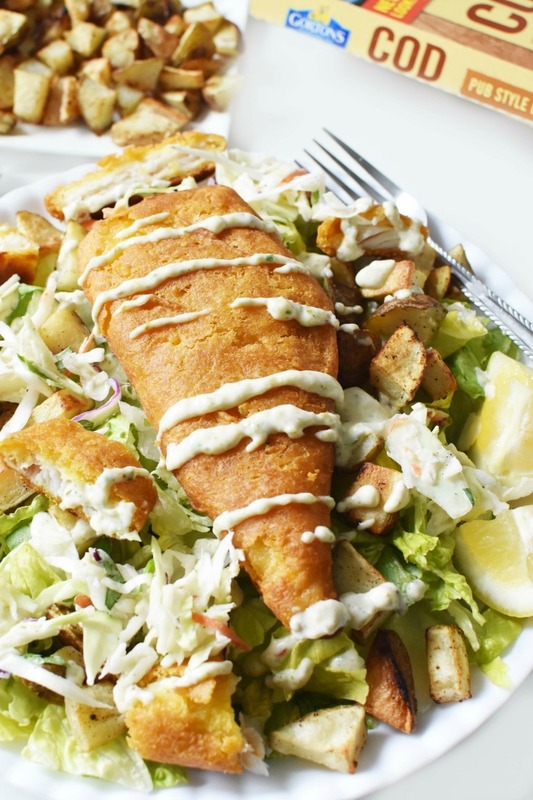 Drizzle with Dressing Serve with a lemon wedge and enjoy! That looks so good! I love all the flavors here, and I love that you used that fish. I love semi-homemade stuff. It saves so much time. Oh yum! We really need a good fish and chips dinner soon. This salad sounds really nice and fairly easy to prepare! This is one salad I’ve definitely never heard of before, but it reminds me of a crispy fish taco, so I’m sure it’s quite delicious. I do wish the font on this comment box wasn’t so faint and tiny though! What a delicious way to present packaged fish! Absolutely brilliant and looks so appetizing. This is definitely something I’d love to make for my family. This sounds and looks AMAZING!!!! WOW! We love Gorton’s seafood, they offer such a quick dinner or lunch option without sacrificing taste! Wow, this looks so amazing! I could really go for this recipe right about now. I’ll be saving this to make later. Can’t wait to try it out. Fish and chips is my favorite thing to order when I’m at an English pub or even at Epcot. I love that I can do this at home now with your recipe inspiration! This looks so good. I am a huge fan of fish and chips. I want to try this. I love this! Looks like a great light meal! Yummy!